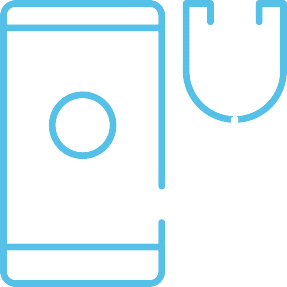 Today, technology is part of the pulse of modern healthcare. 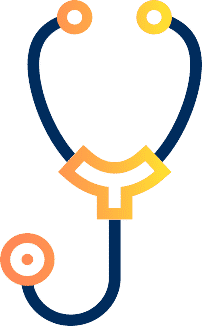 Everyone involved in patient care and management—doctors and nurses, technicians and admin staff—depends on technology to communicate with patients, collaborate with colleagues, and comply with the regulations that protect patient privacy and provide data security. The systems you use need to be as modern as today’s medical technology. They require experienced architects and engineers to ensure they’re the best fit for your needs and the smartest investment for your practice. Not only that, but they have to be implemented carefully, completely and correctly the first time. Computing technologies. That’s everything from your laptops to our data centers to the cloud. Application technology. You need to integrate the front office, practice management and patient portals. Communications systems. We’re talking voice, email and social systems that help you keep in touch with patients. Network infrastructure. From in-office Wi-Fi to the mix of routers, firewalls and servers that keep you online. Key to our success has always been the people and the process we use to ensure the fastest path to success. You’ll start with a Solution Development Architect and a Professional Services SME who know technology and healthcare. They’ll guide you through the entire process. We’ll develop a plan that takes into account your existing systems and new services that. We’ll explain it all, answer your questions, and establish the metrics by which you’ll measure results. The installation, implementation and test phase is structured to be as non-disruptive as possible—working during non-office hours so you’re never stuck downtime or ineffective tools. We’ll take full responsibility for monitoring, managing and updating every aspect of your system. We’ll track performance, look for bottlenecks, install updates as available. 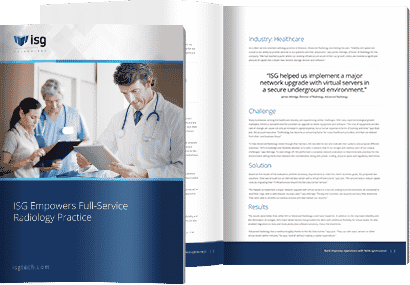 ISG has worked with caregivers, hospitals and admin staff for over 30 years, implementing modern tech infrastructures throughout the Midwest and across the country. Our skills and services are broad and comprehensive—covering every aspect of computing, storage, networking, voice and more. As a client service-oriented radiology practice in Missouri, Advanced Radiology was feeling the pain. ISG performed a complete network evaluation to determine best practices for the environment.